For generations, artists, writers, and musicians alike have called Paris their home. Unfortunately, while you may not be able to hop into a car with them in the middle of the night à la Midnight in Paris, it is possible to walk in their footsteps in a more metaphorical sense. If you’re looking to visit spots in Paris where famous writers have dined, read, written, and lived, look no more. Here are 5 important literary hotspots in Paris! Founded by Sylvia Beach in 1919, the original Shakespeare & Company was half bookstore, half lending library. Not only did her shop attract some of the greatest American writers of the time such as Ernest Hemingway, Djuna Barnes, F. Scott Fitzgerald, T. S. Eliot, Ezra Pound and Gertrude Stein, but Beach was also the first to publish James Joyce’s Ulysses in 1922. Beach was forced to close her bookshop in 1941 and never reopened it. The current Shakespeare & Company was founded by George Whitman in 1951 with the original name of Le Mistral. Whitman changed the name in 1964 in honor of Whitman’s original bookshop. Among some of its early visitors were writers like Allen Ginsberg, William Burroughs, Anaïs Nin, Richard Wright, William Styron, Julio Cortázar, Henry Miller, William Saroyan, Lawrence Durrell, James Jones, and James Baldwin. The store has become a staple for American expats in Paris and tourists alike, and visitors come from all over the world to shop, read and attend literary events. You can read more about its history here. 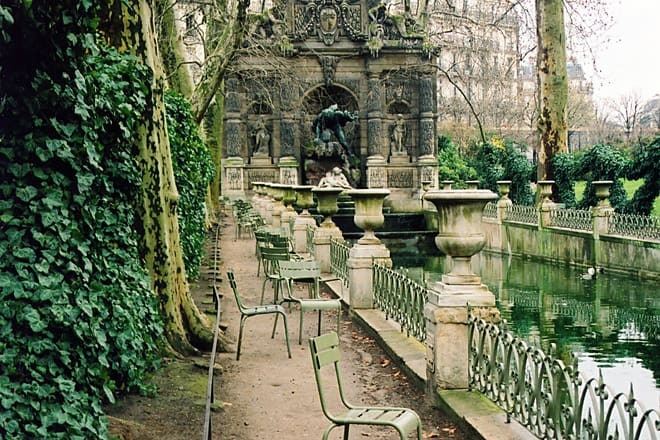 The grounds of the Jardin de Luxembourg, which surround the Palais du Luxembourg, is a lively center of Parisian life. Not only do Parisians come there to sketch, do yoga, read, and write, but these gardens have also inspired famous literary works such as A Moveable Feast by Ernest Hemingway, who came there often after having been “fed with art” from a museum nearby. As if that wasn’t enough, the garden is also the place where Marius and Cosette met in Les Misérables by Victor Hugo! Decades of history (and some delicious escargot) make this restaurant worth a visit. In the 1860s, La Closerie was frequented by Émile Zola, Paul Cézanne, Theophile Gautier, and Charles Baudelaire. A few generations later, Ernest Hemingway, F. Scott Fitzgerald, Henry Miller, Gertrude Stein, and Jean-Paul Sartre all made their way to the corner of Boulevard du Montparnasse and Boulevard Saint-Michel to eat and discuss amongst one another. Though this café was once a low-key hideaway for struggling writers and intellectuals alike, its current prices might make Hemingway turn over in his grave. If you’re looking to bask in the history of the restaurant without basking in credit card debt after having digested your filet de bœuf, consider having a drink at the piano bar. There, you’ll also find a plaque commemorating Hemingway’s favorite spot to sit! This cemetery is the second largest in Paris, after Père Lachaise. Opened in 1824, some of the most famous french writers are buried here, including Charles Baudelaire, Guy de Maupassant, Jean-Paul Sartre, Simone de Beauvoir, and Charles Garnier. Finally, if you’re looking for a cultural hotspot, there’s no better place to look than the American Library in Paris. Opened in 1920 with the motto Atrum post bellum, ex libris lux (After the darkness of war, the light of books), the American Library in Paris sought to bring American literature and culture to France following the first World War. American expats formed the core group of leaders and patrons at the Library; among them were Ernest Hemingway and Gertrude Stein, who also wrote articles for our newsletter, Ex Libris. Thornton Wilder and Archibald MacLeish were early borrowers at the Library as well. In 1941, Sylvia Beach was forced to close Shakespeare & Company after refusing to sell a Nazi officer her last copy of Finnegans Wake, so she donated books from her lending library to American Library in Paris. After the second World War, the Library saw a new wave of American writers, including Irwin Shaw, James Jones, Mary McCarthy, Art Buchwald, Richard Wright, and Samuel Beckett. As a nearly 100-year-old Library, this only begins to scratch the surface of our legacy—you can read more about our rich history and even view a timeline of important events here.